Davids says she’ll reopen constituent services office in Wyandotte County – Welcome to Wyandotte Daily! 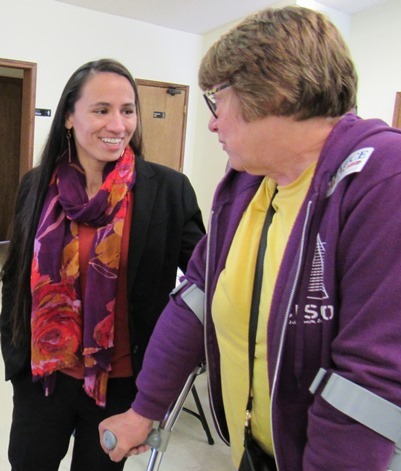 Sharice Davids, Democratic candidate for U.S. representative, 3rd District, today pledged to reopen a constituent services office in Wyandotte County if she is elected. 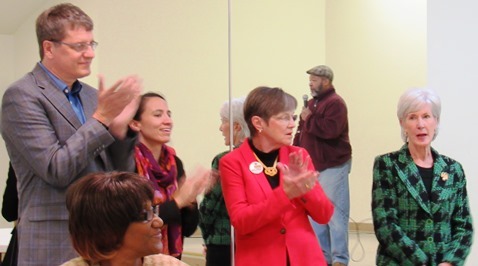 Davids spoke at a “Souls to the Polls” rally at the New Bethel Church, 745 Walker Ave., Kansas City, Kansas. She was joined by former Gov. Kathleen Sebelius, Democratic gubernatorial candidate Laura Kelly and Democratic secretary of state candidate Brian McClendon at the rally. There hasn’t been a 3rd District Congressional constituent services office in Wyandotte County in the last several years that Rep. Kevin Yoder, R-3rd Dist., has been in office. Yoder’s office has been in Overland Park in Johnson County. His predecessor, former U.S. Rep. Dennis Moore, D-3rd Dist., had an office in Kansas City, Kansas. People shouldn’t have to travel that far to get services or see their representative, Davids said. Davids talked about connecting to the people. She said that in Washington, D.C., “it’s very clear you’ve got a bunch of people making decisions that affect our everyday lives” who do not know how those decisions affect people. Currently, according to Davids’ website, she has campaign field offices on North 5th Street in Kansas City, Kansas, and in Overland Park. If elected, she will have a constituent office in Wyandotte County as well as one in Johnson County. She talked about the importance of the voter turnout. She said that in the Republican primary for governor, only 343 votes separated the first and second places. Kelly faces Kris Kobach, the current Republican secretary of state, in the governor’s contest. Sebelius said former Gov. Bill Graves, a Republican, will join Kelly and Sebelius on Monday in campaigning. 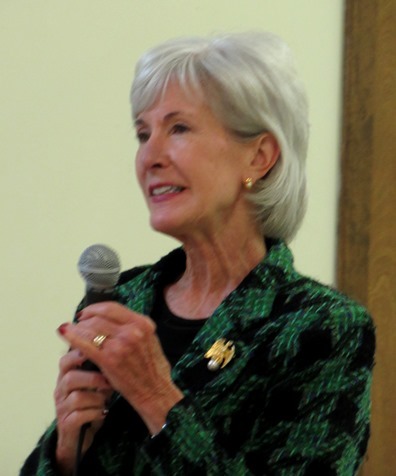 “We need to make sure that everybody gets out and casts their ballot,” Sebelius said. 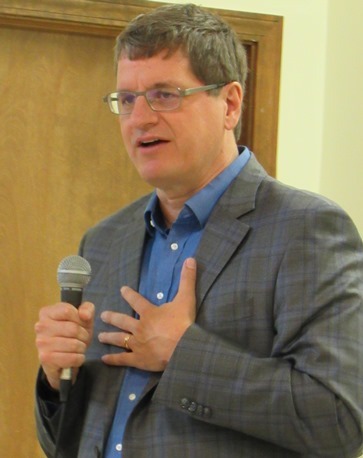 Brian McClendon, the Democratic candidate for Kansas secretary of state, said there were already 340,000 votes cast in Kansas in early voting as of this morning. That includes 140,000 cast in the 3rd District, “because of Sharice Davids,” McClendon said. McClendon said that is 30 percent over the 2014 numbers. He urged the campaign volunteers to work to get the voter turnout up, and especially, try to reach those who usually only vote in presidential elections. 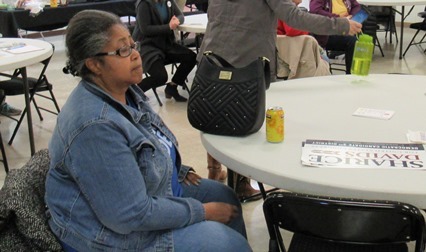 Alyce Edwards, vice chair of the 3rd Congressional District Democrats, was in the audience with about 50 others today and said she believes residents of the 3rd District will elect six more Democrats to seats in the Kansas House. “I believe the women and young people of Wyandotte County are going to come out, and going to show out, and bring about changes in Topeka and the 3rd District,” Edwards said. 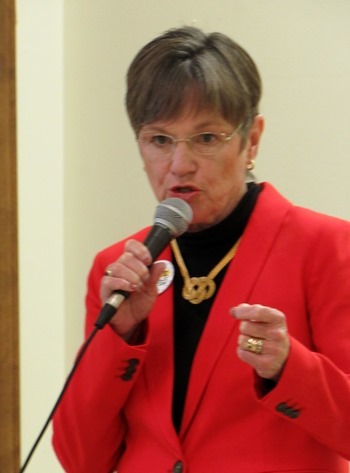 State Rep. Pam Curtis, D-32nd Dist., who is running unopposed for re-election, attended the meeting and afterward was asked if she was afraid of a caravan of undocumented immigrants coming through Mexico toward the United States. She said that she was not afraid, and it was sad that some are trying to demonize the refugees. Looking at photos of the refugees, she realized they have been through so much and there are a lot of youth in the group, she added. She was in favor of letting the refugees go through the process of requesting asylum. Also attending today’s rally, but not speaking, were Tony Martinez, a candidate for Wyandotte County District Court judge; Dr. Evelyn Hill and former Mayor Carol Marinovich. Outstanding event. We at New Bethel Church were honored to host. All citizens must exercise their right to vote. Your voice is your vote!